When you think about walking in the rain, images of cold, wet and unhappy hikers may come to mind but really it doesn’t have to be that way. 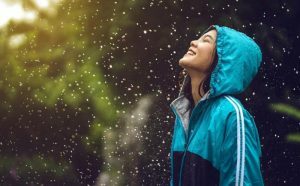 Walking in the rain can be a joyous, invigorating experience – just ask any *pluviophile. Also remembering that our beautiful native trees, colourful wildflowers and incredible landscapes were all made possible by the relentless pitter-patter of billions and billions of raindrops. If you adopt the proper attitude, you can learn to love hiking in the rain. Preperation helps too, so follow these steps to remain happy when you’re out on a bushwalk and the heavens open. No cotton. This is key for next-to-skin layers because cotton holds water, including your sweat, and chills you. Go with wicking materials like wool, nylon or polyester clothing instead. Go with synthetic insulation in your jacket. Standard down loses much of its insulating ability if you get it wet. Water-resistant down and hybrids that combine synthetic insulation and water-resistant down are your next best bet. This is all part of layering your clothes. Evaluate your rainwear. A proper waterproof outershell jacket is the way to go – and don’t be a tight-arse when buying one! Going with bright colours can help brighten your mood on a relentlessly grey day. In an emergency, bright colours also help search teams locate you. Pack a rain cap. Even if your rain jacket has a brimmed hood, it does a poor job of keeping rain off your face or glasses. A rain hat should have a nice, broad brim. If you choose a ballcap-style hat, then you can wear it under the hood of your rain jacket. Evaluate your footwear. Waterproof boots and shoes keep feet drier initially, making them a good option for colder conditions. Renew the waterproofing at the beginning of each season, or if you notice large dark spots forming when you splosh across wet terrain. Mesh footwear works well in milder conditions, as mesh drains and dries more quickly if you land in a puddle or creek. With either option you need deep lug soles to deal with mud and superior traction to deal with slippery rocks and logs. Click here for more info about footwear. Pack gaiters. They’ll shield your socks and the tops of your footwear. Pack dry clothes. Extra clothing is already one of the Ten Essentials. Be sure dry socks are one of the extras you bring. Consider a pair of walking poles. 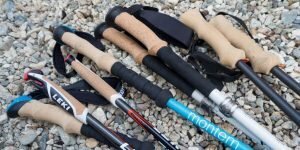 Click here for more info on how to use walking poles. Walking poles will come in handy. Pack a raincover. Some daypacks and rucksacks come with one, or you can buy a cover sized to fit your pack. Lightweight dry sacks. You can use these inside your pack for your most vulnerable gear. Waterproof cases. Look for one that’s specially designed to fit your phone or other favourite gadget. Ziplock plastic bags. These are inexpensive, though not unfailingly waterproof nor particularly durable. Garbage bags. For extra water protection you could use a garbage bag as an inner lining to your pack. Plus – of course – they’re ideal to store your garbage in. A significant storm system can create dangers and health concerns. If you’re on the lookout, you can take steps to avoid unwanted complications. Slippery surfaces. Tread carefully on muddy slopes, slimy rocks and rain-slickened logs. Walking poles will help! Hypothermia. Watch for the “umbles”: mumbling, grumbling, stumbling and tumbling. Those are telltale signs that you need to stop, dry out and get some calories in you. And, in general, you need to eat and drink more often than you would in sunny weather. If rain discourages rest stops, drink and snack while you’re hiking. Swollen creeks. These can be problematic so you need to use your commonsense when crossing them. 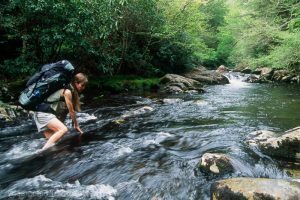 However if you decide to cross the creek remember to test the depth and power of the water with a stick and unbuckle your hipbelt before you cross, so you can easily get free of your pack if you slip and fall into a fast-moving current. Also pairing up with your walking buddy and locking arms will give you both a lot more purchase on the creek bed. Of course if you’re doing a pack free guided walk with Life’s An Adventure your professional guide will tell you all this if the situation arises. All care must be taken when crossing swollen creeks! *Pluviophile:(n) a lover of rain, someone who finds joy and peace of mind during rainy days.